Venezuela's sitting president, Nicolás Maduro, attends a ceremony Thursday in Caracas to mark the opening of the judicial year at the Supreme Court of Justice. Opposition leader Juan Guaidó has declared himself the interim president, but Maduro has not ceded power. "The U.S. government has limited ability to provide emergency services to U.S. citizens in Venezuela. 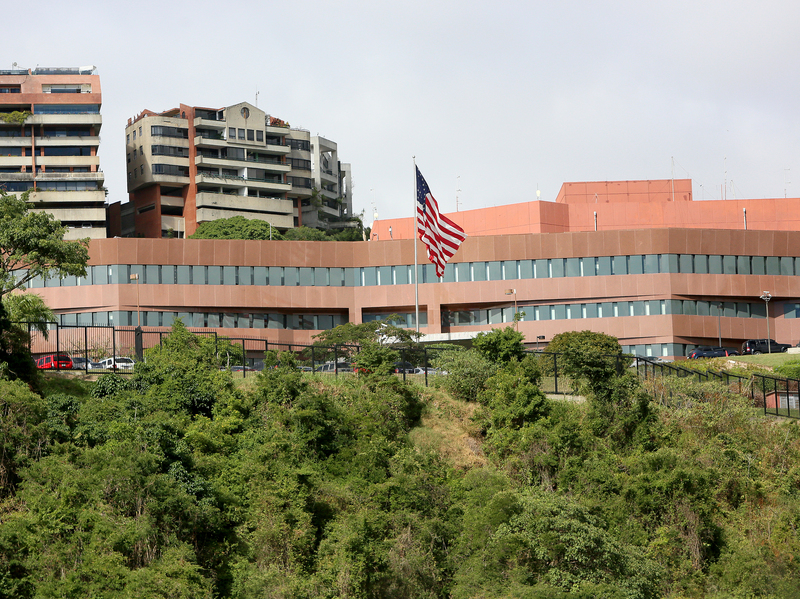 U.S. citizens should contact U.S. Embassy Caracas for consular assistance. U.S. citizens residing or traveling in Venezuela should strongly consider departing Venezuela. Commercial flights remain available," the statement said. In an interview with commentator Laura Ingraham, Pompeo said the Trump administration is focused on the safety of U.S. personnel. "We are continuously, 24/7, evaluating security conditions. There's no higher priority for the State Department than to keep all the people in our missions safe and secure. And we've made clear to the Maduro regime that it is our expectation that they will be safe and secure. And we will continue to evaluate," said Pompeo. The Secretary's statements and the State Department alert came in the second day of rapid developments in the Latin American nation long wracked by political and economic turmoil. Venezuelans woke up Thursday morning with two men claiming to be their nation's rightful leader: sitting President Nicolás Maduro and upstart opposition leader Juan Guaidó, head of Venezuela's National Assembly. The day before, Guaidó took the oath of office in front of massive crowds that filled the streets of Caracas and declared himself interim president, pledging to hold general elections. The U.S. immediately declared its support for Guaidó and has called on other nations to recognize him as the country's leader. Maduro has not ceded power. He tweeted that the country was facing "extreme imperial insolence" that "seeks to impose a puppet and servile government" and told U.S. diplomatic personnel to leave within 72 hours. "Venezuela Is Respected! #YankeeGoHome," he wrote. On Thursday, Maduro ordered all of Venezuela's diplomats in the U.S. to go home and said the country's embassy and consulates in the U.S. will close, The Associated Press reports. The day before, Maduro declared that he was breaking diplomatic ties with Washington. Secretary of State Mike Pompeo said that because the U.S. does not consider the Maduro regime legitimate, "We therefore consider all of its declarations and actions illegitimate and invalid." Maduro said U.S. is foolish to defy his order, according to the AP. Pompeo announced that the U.S. will give Venezuela more than $20 million in humanitarian aid. Speaking Thursday at a special meeting at the Organization of American States in Washington, D.C., Pompeo said the funds are to help Venezuelans cope with severe food and medicine shortages and other impacts of the country's political and economic crisis. Nicolás Maduro has ordered U.S. diplomatic personnel, such as those at the U.S. Embassy in Caracas, to leave the country, and Venezuelan diplomats in the U.S. to come home. Until recently, few Venezuelans even knew who Guaidó was — but now the 35-year-old is leading a high-stakes charge to end the Maduro regime. Pompeo affirmed U.S. support for Guaidó and called on Venezuela's security forces to ensure his safety. Maduro needs support of the army's high command if he is to remain president – and so far, it appears that he has it. Venezuelan Defense Minister Vladimir Padrino López appeared on state-run television Thursday, surrounded by the military's top brass, and called Maduro the "legitimate president." He accused the opposition of waging a coup, Reuters reports, and said the U.S. and the other countries were carrying out an economic war against Venezuela. 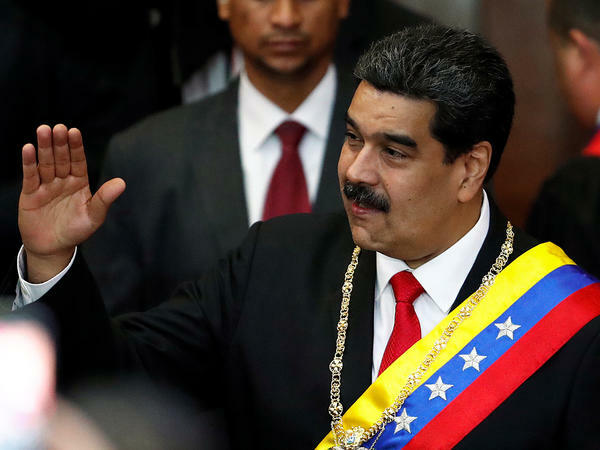 In a televised address from the presidential palace on Wednesday, Maduro also accused Guaidó and Washington of staging a coup. National security adviser John Bolton said Wednesday that the U.S. would not rule out military options but that its focus is on cutting off revenue to the Maduro regime and building recognition of Guaidó among governments in the Americas and Europe. Maduro has been in office since 2013, and he was sworn in to a second term two weeks ago. That election was marred by reports of vote-rigging and coercion, and afterward, the U.S., Canada and 12 other countries in the Americas rejected its legitimacy and downgraded diplomatic relations with Venezuela. The U.S. has imposed sanctions on Venezuela's gold sector, as well as on former Venezuelan government officials. Asked Wednesday why Maduro has been the subject of sanctions while authoritarian leaders elsewhere enjoy favor with the Trump administration, Bolton replied: "The fact is Venezuela is in our hemisphere, I think we have a special responsibility here, and I think the president feels very strongly about it." As the political crisis in Venezuela takes hold, nations around the world are choosing sides. The South American countries of Argentina, Brazil, Chile, Colombia, Ecuador, Paraguay and Peru have all declared their support for Guaidó, the BBC reports. Canada also voiced support for the opposition leader. Britain's foreign secretary, Jeremy Hunt, called Guaidó "the right person" to lead and said Maduro is not the country's "legitimate" leader, but he stopped shy of recognizing Guaidó as president. 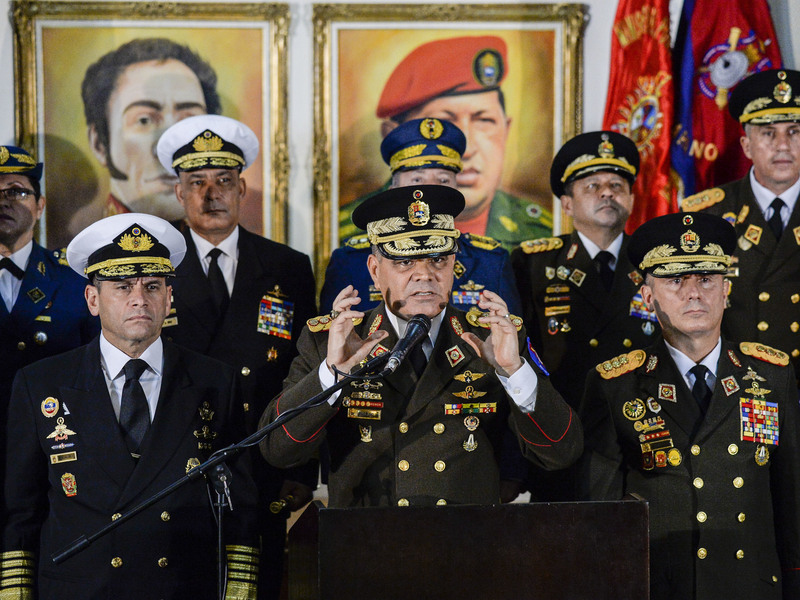 Flanked by other Venezuelan military leaders, Defense Minister Vladimir Padrino López expressed support for Nicolás Maduro on Thursday in the capital city, Caracas. But Russia, which counts Venezuela as its closest ally in Latin America, has rallied behind Maduro. Russian President Vladimir Putin spoke by phone with Maduro, the Kremlin press service said Thursday, and "stressed that destructive outside interference grossly violated the fundamental norms of international law." Russian Prime Minister Dmitry Medvedev suggested consideration of what Americans would do if the tables were turned. "Just imagine for a moment how the American people would react to the news the budget crisis (shutdown) has produced a situation in which, say, the speaker of the House of Representatives has declared himself a new president," Medvedev wrote on Facebook, according to Russian news service TASS. "And how would the existing U.S. president react?" Mexico, which itself has a new president, released a statement of "non-intervention" — which essentially means support for the Maduro regime. And Cuba's foreign ministry said it was backing Maduro against a "coup d'état" to impose "a servile government under orders from the United States," according to the AP. Turkish President Recep Tayyip Erdogan said he was shocked at the Trump administration's move to back Guaidó and reiterated his support of Maduro, the news service reports. At least 16 people have died in the recent protests, according to the Venezuelan Observatory of Social Conflict. More than 3 million Venezuelans have fled the country to escape shortages and hyperinflation. Most have gone to Colombia, Ecuador, Peru or Brazil. Oil prices rose on Thursday, following U.S. signals that it may sanction Venezuela, a member of OPEC.